Would you want a powerful software which can clone dynamic disk in Win 7? What Is The Common Charateristics and Differences between Dynamic Disk and Basic Disk? Before starting to clone dynamic disk in Win7 by Partition Clone, let’s get some informations about dynamic disk and basic disk. The common characteristics: they both support MBR and GPT partition style. And we can convert basic disk to dynamic disk easily in both type of disks. The differences: the dynamic disk can extend with a noncontinuous partition or disk on one or more disks while the basic disk can extend partition along with a continuous partition on a single disk. In addition, a dynamic disk has a greater flexibility for volume management by using a database to track the information about dynamic volume on the disk or other dynamic disks. But what confuses us is that it’s difficult to clone dynamic disk in win 7, It doesn’t matter, and a third-party tool like AOMEI Backupper can solve it. A few days ago, a user told me that he owns a C drive of Win7 in a dynamic mode, he tries to clone dynamic disk in Win7 to a new SSD drive by a third-party tool, but there is no way to select the source drive. Why? That is because the True Image 2013HD cannot support the dynamic disk, you could find another one to solve it. With the increasing development of technology, there are a lot of third-party tools that can clone dynamic disk to basic disk, but you need to pay for it. AOMEI Backupper can support to clone it by free. In AOMEI Backupper, you can easily clone it to a basic disk, then clone it to your new SSD drive. In Partition Clone, you could directly clone the dynamic disk volume to the disk you want to. And you still can divide it in a detail step. Taking clone dynamic disk to a new SSD as an example: you can directly clone it to SSD drive. But you still can clone the dynamic disk volume to a basic drive first, and then clone a basic drive to a new SSD drive. 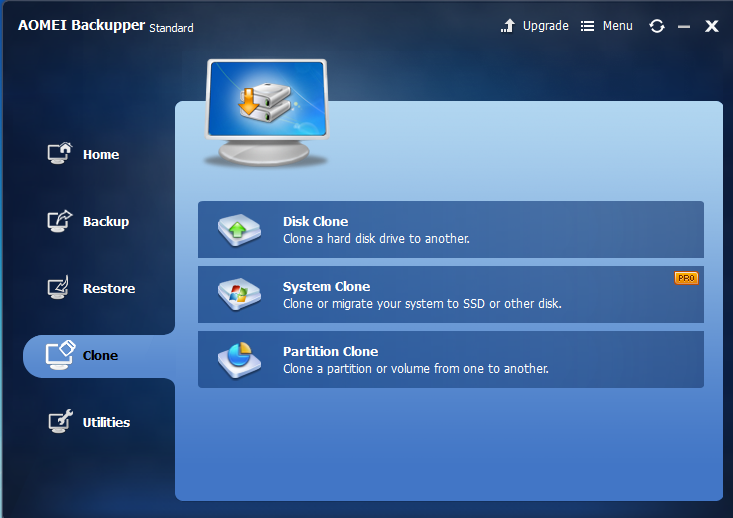 Step 1: Download free backup and restore software and then select the Partition Clone. Step 2: In this window, you can select the dynamic volume you want to clone and then click Next. Step 3: In this window, you are supposed to select a Destination Partition to store the dynamic drive you want to clone, then click the Next to step into another window. Step 4: Now, you can see the Operation Summary below. As you can see there are another choices you could make according to your needs. If you want to resize your partition, you can tick “Edit the size of partition". If you want to clone dynamic disk without data loss, “Sector by Sector Clone” may help you. After you finish the preparation, tick the button “Start Clone”. If your Destination Partition is solid state drive (SSD), we recommend you to tick the choice “Align partition to optimize for SSD”. If you select this option, the program will automatically optimize the reading and writing speed for your SSD, and also be able to extend the life of it. Step 5: In this period, you just need to wait a few time. After the progress ends, tick the Finish. Note: to ensure your data is complete, you could tick “On completion”. When you do it in advance, the program will check your data in the Partition Clone Progress. 1. It is easy to clone dynamic disk in win 7 with a powerful tool AOMEI Backupper. if you still are confused by this problem, you can try it.